Svilana Shabaltina, born 1948, graduated from the Moscow "Gnesin" State Pedagogical Institute (presently Russian Musical Academy) in 1972. Her creative development is connected with outstanding musician professor B.Ya.Zemlyansky, who himself was an assistant of famous prof. L.Oborin. Presently S.Shabaltina is assistant professor at piano chair Kiev "P.Tschaikovsky" State Conservatory. 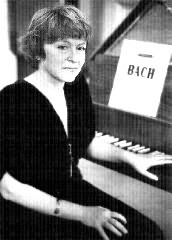 In 1990-9'1 S.Sha-baltina worked on probation at Krakow Musical Academy (Poland) under direction of well known harpsichord performer Elegbetta Stephan'ska. S.Shabaltina's concert activity as a piano and harpsichord performer is very impressive. She is active also in chamber music. She was rewarded as a winner in the all-union cello competitions as best accompanist 0983, Moscow). S.Shabaltina had been giving solo concerts in U.S.A., Germany Czechia and Poland. She took an active part in many festivals of modern music in Moscow and Kiev and festivals of baroque music in Krakow (-1972) and Kiev (1994). Having been one of initiators of the first festival "Ukraine and Baroque World", she performed Bach twofold and threefold concerts (together with E.Stephanska and Volt Ditert Neupert (instruments of the Neupert company). Since 1994, for the first time in Ukraine, she had organized a harpsichord class at the Kiev Conservatory. Hourly play duo with Oleg Kudryashov (flute). This duet greatly performs abroad (Poland, The United States, France, Czech Republic, Bulgaria, Rumania), has a great variety of programs from old music up to modern one. The press notes the depth of understanding of music, the virtuosity and brilliancy of performance.